The Atacama Crossing was an exciting and fantastic journey. It was my first self-supported stage race so I had a lot to learn about the gear and what I needed to take with me. I read a lot of reports on the internet, looked at the pictures of previous 4Deserts events and the Marathon des Sables, spoke to friends who had run the race before, and worked with Matias to get to the optimal amount of gear. Once I had come up with the tentative gear list I trained with my pack, slowly building up to the race weight that I would be carrying. Overall I was very pleased with what I took and it mostly worked according to plan. I started with one of the lighter packs, around 6.5kg or about 15 pounds, and that lightened up as each day went by. I had the minimum gear and also a few luxury items (toothbrush, iPod, a few extra calories per day). However, there's always a little room for improvement and ways to tweak gear after experiencing using it in a race so here's an outline of how my gear worked and what changes I might make in the future (especially as my little brother asked for it! In the comments here). Salomon pack and front bottles: the Salomon XA20 pack with two bottles on the front was a great combination. It was a tight squeeze to get my gear in there, but I was pleased to have a pack that was small, light and kept me to the minimum gear. I would not go any bigger in the future and after running with this pack for many miles in training I was comfortable and happy during the race. The front bottles worked well and made it fast and easy to drink and easy to fill up during each stage. This was a great combination that I would use again. 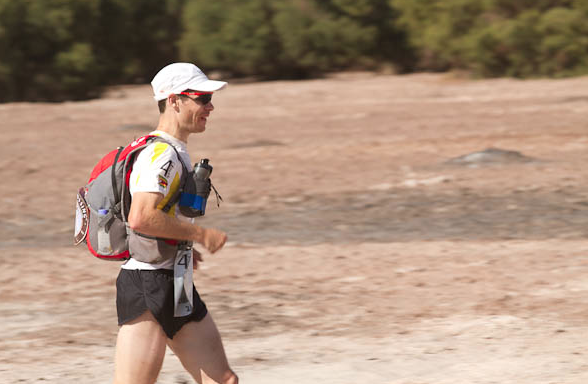 Dry bag: a required item after there was nonseasonal rain in the Atacama in the week leading up to the race. I took a small dry bag which I used for my sleeping bag and clothes. I don't think this was needed to keep my gear dry, but it did help to keep everything organised and was useful as a pillow too. Sleeping bag: my Marmot Atom bag was ideal. It was light, kept me warm even on the coldest night and didn't get dirty even though I was putting my dirty body in it every night and often in the afternoon too. A great sleeping bag that I looked forward to using at the end of each day (and it is red!). Running shoes: I couldn't decide before the race whether I wanted to use my Brooks Cascadia 6 or my Brooks PureGrit shoes. The Cascadias are great shoes, durable, cushioned and have a rock plate. The PureGrit is a light and fast trail show with a lower drop (4mm v 10mm). Matias convinced me that the Cascadias were the best choice and I'm glad I went with these shoes. They provided enough cushioning and felt great on my feet for all the stages. I got a few blisters, but that was a result of sand getting through the mesh in my shoes. Wearing full sand gaiters would solve this problem easily and let me wear these great shoes without any problems at all. Wigwam socks: Great socks that were long enough to wear with my gaiters and felt comfortable during the race. I did get some minor blisters due to sand in my shoes, but I don't think any other socks would make a difference with this problem. I took two pairs and was very happy to change into a clean pair of socks on the long day. Running shorts: I took a spare pair of light, short running shorts. These were supposed to be to sleep in and for after each stage. When my tights started chafing I changed over to these and used them exclusively for the rest of the race. They felt great, most importantly didn't chafe and I didn't have to think about them. I'm definitely wearing running shorts in future races. T-shirts: I took two Brooks white t-shirts. They fit well, were white so they didn't get too hot in the sun and they felt comfortable all the way. I was happy with this choice. Cap: I wore a light, white mesh cap that I received at the Lican Ray to Villarrica race. It kept the sun out of my eyes and fit well. I would probably change this at my next race to a desert cap to meet the neck cover requirement and to provide some shade for my neck. Sunglasses: my Oakley M-frames are my favorite piece of gear ever! They fit great, keep the sun out of my eyes, are durable and fit super-comfortably. I cannot recommend these highly enough. Required gear: I didn't use the gloves at all, wore the warm hat during a few cold nights, used all my sunscreen (I took double the minimum and was glad I did - highly recommended), and used all the alcohol gel to clean my hands and also to clean my feet before taping them in the morning. Some of the required gear I used, some I did not, but I had to take it so I might as well use it. Blister kit: this was required gear, but gets a category of its own because it's so important! I used all my tape and it helped tremendously with preventing blisters. I would recommend taping feet for every stage and I preferred the elastic tape that I had in my kit. I taped my forefoot and big toe for the first few stages and later in the race a few trouble spots on other toes. Learn how to tape your feet and take plenty of tape - this can make or break your race. Headlamps: I took two Petzl headlamps: a TacTikka and a E-lite. I only used the TacTikka as I didn't need a backup during the race. This light worked perfectly. It provided enough light and the red light was useful so I didn't disturb my tentmates in the night. Two great lights that I would take again. iPod shuffle: My shuffle doesn't weigh much and when I put on a great playlist from V during a tough section and during the night it more than contributed for its weight. The shuffle really really helped get me through some of the evenings and some tough patches so definitely on the list of successfuly gear. A key fact to remember is that while you spend a whole week in the desert only 30 hours of that are running. There is a lot of down time and having some sort a distraction or something comforting helps to get through the hours of rest. My iPod provided that for me. Toothbrush and toothpaste: these were my luxury items and went a long way to making me feel better after I worked through my sweet protein shakes and expedition meals. I would definitely take these again. Food: I took a simple diet for this race: a protein shake before the day's stage, two protein shakes after the stage and during the evening an expedition foods freeze-dried meal. This was a low amount of food and I was hungry, but it was enough. I was happy with what I took, but would consider taking a little more food and maybe slightly more variety for a future race. Potential options that I woould consider are high calorie items, such as dates, and very flavorful foods, such as parmesan cheese and serrano ham. Fully loaded and running with my gear. Bladder: the mandatory gear list required that we would be able to carry at least 2.5l of water. I had two front bottles and a bladder to carry this amount. I used the bladder only once and it was difficult to fill up. I saw a few other competitors had platypus soft bottles that they could easily access and which were fast to fill up and easy to carry. I think that this is a better option. Gaiters: I used a pair of REI gaiters that covered the top area of my shoe, but not the whole shoe. A few times during the week the cord holding the gaiter under my shoe broke and I had to make an emergency repair. The breaking was not a huge problem and it was easily remedied. The problem I had was the the gaiters did not cover the whole top of my shoe so sand still managed to get in through the mesh on my shoes. I will use a different gaiter next time. Salomon 3/4 pants: these are great pants, but they chafed near my groin during the first and second days so I decided not to wear them anymore. I think that the coverage of my leg was great and the compression helped, but the chafing was too much so I wouldn't use these again. I would probably only take a single pair of running shorts that I would use for all the stages and all days of the race. Salt: I didn't take my salt regularly and probably needed to take more than I did. I don't think it is fair to blame the salt tablets, but I didn't use these effectively and need to look to find a way to improve my salt intake regardless of whether it is changing the type of tablet or adapting my training to practice taking tablets regularly. Race food: I took gels and didn't take them as regularly as I planned. I think that more variety is required for me to keep eating during the stages and this is an important area to improve. I like gels and they work for me, but only when I actually take them! Compression socks: I took compression socks to wear after the stages and help my recovery. These helped a lot after my long training runs, but I didn't use them much. Again, I don't think this is the fault of the gear, but rather something I need to work on or an in-race routine that I need to develop. Arm warmers: I took these to provide extra warmth during the stages, as an additional layer for during the night if it got too cold and because they're easy to put on and take off with other gear on. I used them at the beginning of the first stage and that was it. They are a great piece of gear, but it was warm enough during the stages to do without them and I didn't need the extra layer at night. These would be left behind. Base layer t-shirt: I took a tight base layer t-shirt instead of a jacket and to wear at night. I wanted to carry something lighter than a jacket, to have a cosy layer to sleep in and wear around the camp and to have a long-sleeve top to wear during the race if I got sunburnt. I wore the long-sleeve shirt around camp and to sleep in, but I had to change in the morning to my race t-shirt and then wait for the start without a warm layer. I would change my combination of upper-body clothing from two t-shirts and a long-sleeve base layer to a t-shirt, a long-sleeve t-shirt and a jacket. Sandals: I was sneaky and brought a super-light thin pair of pedicure sandals that I got from V. They broke in the first five minutes I was wearing them! The ground is too hard and rocky to walk on without shoes so you have to wear something when you're around camp (and it became a requirement later in the week after some people got diarrhea). After my sandals broke I was fine wearing my running shoes. This might be a different story if I had bad blisters, but I would take the risk and go without sandals. Buff: the mandatory gear requires a desert cap or a hat with some sort of neck protection. The buff met this mandatory requirement, but I never used it. I would prefer to carry a desert hat to meet this requirement and leave the buff behind. Alcohol gel: I mentioned how useful this was previously and that's 100% true, however, I carried two little bottles and one was definitely enough. Nothing extra coming with me next time! 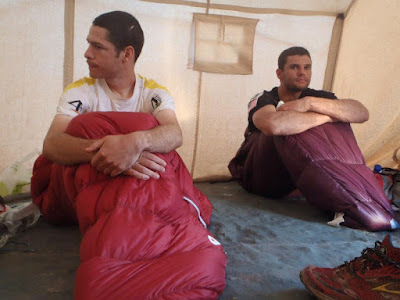 In the tent, with my sleeping bag, race t-shirt and shoes in the picture (and Jimmy!). Sleeping mat: Matias told me to bring one, Francisco lent me one and I still didn't bring one! I made it without a sleeping mat and slept fine each night and wasn't negatively impacted at all. However, I spent a lot of time in my tent, relaxing and recovering for the next day so I think this would be a small luxury that would be worth carrying. This is similar to my thoughts on the iPod, there is so much time that you spend in your tent and not running that it is worthwhile to do it in comfort. Jacket: I chose a base layer instead of a jacket and in terms of warmth I was happy with the decision. However, having a jacket that I could easily and quickly put on or that I could leave on until the last minute before the race would have been a better choice. If you have any questions or would like more detail of how my gear worked during the race, leave a comment and I'll answer your questions below. My Atacama Crossing summary post showing the gear in action. An Susitna 100 gear post showing what's needed for a winter ultra (a real contrast!). A review of what worked and what didn't at the Susitna 100.